Every year we celebrate Advent, but every year is a little different. Once again I find the need to scale back and celebrate simply. With a move on the immediate horizon, we’ve decided not to pull out all of our Christmas decor and paraphernalia, and we’ve decided to scale back our activities as well. But we ARE celebrating Advent. Celebrating isn’t about the stuff, and I THINK.. I could even do it without a Christmas tree. ;0) Not that I want to try that. Yet. 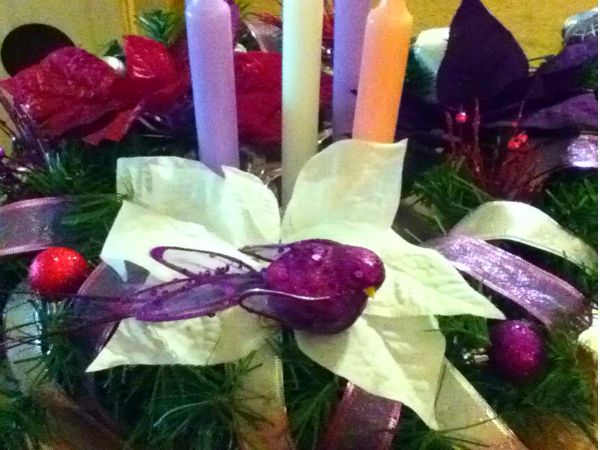 Advent Wreath – In addition to our tree we’ll be doing our Advent Candle Wreath with weekly candle readings and reading Destination: Bethlehem each evening. Yesterday, the kids and I bought some inexpensive supplies at Walmart and assembled our own Advent candle wreath. We have done different things for a “wreath” in the past but this is the first year we’ve used an actual *wreath* and the first year we’ve decided to use pink and purple. We really like it! And that’s it! No Advent calendar, no busy activities every day, no extra decorating. We’ll watch movies, sing songs, and drink egg nog throughout the month but we’re not overly planning. It’s really simple, right? It’s also… kind of appealing. =) It will be really helpful, too, since there’s a lot of other busywork and overplanning to be done, getting into the other house. The 2008 Advent posts take a “how-to” approach, with links and instructions for many traditions and activities that we use to focus the Advent and Christmas season on Jesus Christ and God. Symbolism plays a large role in our activities and traditions to point what we do to the gospel story. The 2009 Advent series is more detailed, thoughtful and explains more about Advent, the holiday, and the preparation of our hearts. It incorporates the use of traditions and activities to intentionally and thoughtfully celebrate the holiday season. Expectation : Why Advent? What is it? Goals, etc. Execution : Making it happen. Anticipation : Layering traditions to build anticipation. Culmination : It’s all been building up to this. Resolution : An end, and a beginning. For 2010, we kept things really simple. We mostly focused on our Advent Candle Wreath and readings, our Jesse Tree and decorating symbolically. An Argument for Santa #1: But it’s FUN. An Argument for Santa #2: He’s Based on Saint Nicholas. There are other posts I have written over the years, peppered here and there and not belonging to a specific Advent series. Where is He? – Do you ever feel like something’s MISSING? Do you sometimes get so caught up in Christmas you feel like you lost Christ along the way? You’d Better Watch Out, You’d Better Not Cry… – in which I first confessed that Santa and I had a falling out, and that something needed to be done. What to do? How We Fired Santa – In which we, yes, FIRED Santa from our Christmas traditions once and for all. How and why we let that go. How to Make an Advent Calendar – One of the first we ever made, one of the easiest to create if you have littles. Our New Christmas Tradition (The Gifts of the Magi Revisited.) – Taking our “Three Wisemen Gifts” even further… and LOVING IT. The first year “donated” our “gold” gift to Operation Christmas Child, the next year we chose Women At Risk, the third year we picked World Vision, and this year we’re doing Operation Christmas Child again. Whether you celebrate Advent or not, I pray that you have a blessed holiday season and a wonderful Christmas. God bless!